"Full House, house full of men ... Danny, Jesse, Joey, father, uncle, friend ... Uncle Jesse whose hair is never messy. Watch the hair hugh? Have Mercy on uncle Jesse. Three men raising 3 girls. Or are the girls raising them? Wake Up, San Francisco... No women in this full house, this house full of men ... This male dominated house. Cut it out!" 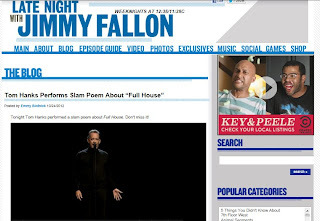 Much more than a 3-minute recital, Hanks poetically performed slam poetry about "Full House," popular '90s sitcom that chronicles the life of a San Francisco widower who commissions his two buddies to help raise his three daughters. 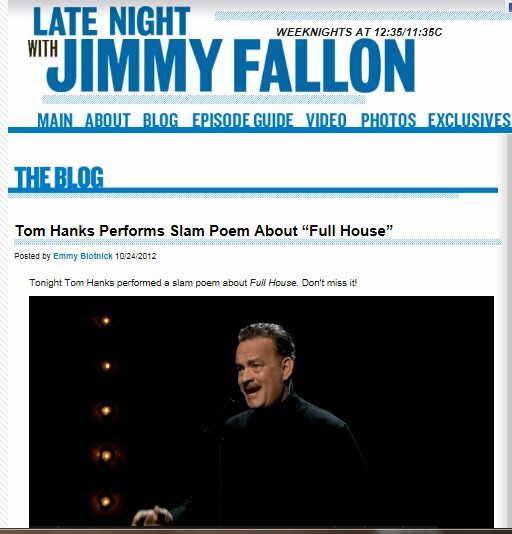 Did you watch Hanks performance last night? Thanks for sharing. I saw the video and enjoyed it. Hanks is a poet and knows it! Tom Hanks is one of those characters that is simply awesome. Anyone who can make a movie like "castaway" and be by himself the entire time is simply great! 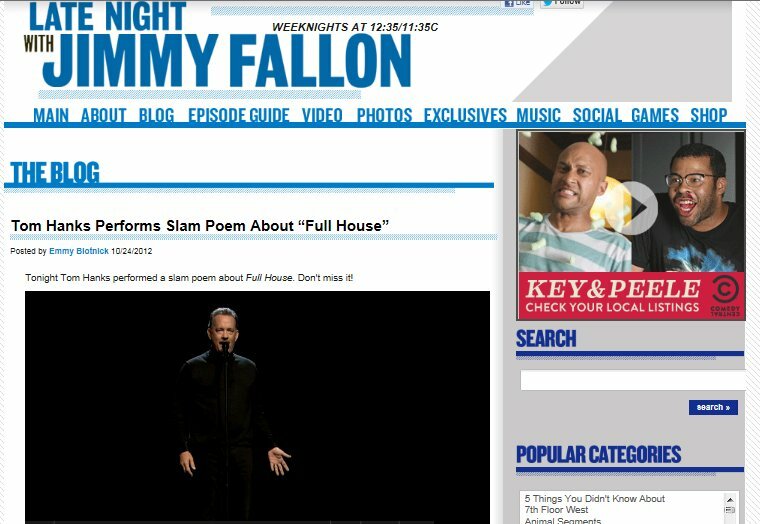 It's nice to see they are mixing it up a bit in late night tv now. The last few shows I seen on any of the networks was only shameless plugs of upcoming movies or shows. Most of which was not entertaining at all. Never quite got the gist of Slam Poetry ..